It’s been called “The Wire with wheelies”, and for those who had a chance to see the gripping film 12 O’Clock Boys this week at the Charles Theatre, that description might well carry along with it a bag full of mixed emotions. How was this film shot? Who are these outlaw riders? Why doesn’t the city stop them? Why would anyone make a film which seems to glorify this lifestyle? Eric Blair, the producer of the film, addressed some of those concerns yesterday morning during an hour-long behind-the-scenes talk at the Eubie Blake Center in Baltimore. Blair’s presentation was the latest installment of the new Creative Mornings Baltimore series. 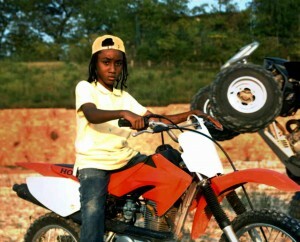 12 O’Clock Boys is a documentary which looks at the outlaw street dirt-bike culture which permeates some of the poorer neighborhoods of Baltimore City. The film is currently the second most popular documentary in the world. It is also the tenth highest rated independent film. The film is unique as well in that it is a hit simultaneously in both theaters and video on demand. A motorcycle rider himself, Blair became intrigued with the idea of doing a feature length documentary on this seething sub-culture after seeing a short student film on the subject by Lotfy Nathan. Nathan was enrolled at the Maryland Institute College of Art (MICA) when he began filming the ubiquitous street bikers in action. While the film features shots of more than a hundred riders, the story revolves around a precocious boy named Pug; his mother Coco; and Steven – a man in his thirties who is seen as a sort of patriarch to the urban riders. Pug was only 11 when he became the center of the story. “Lotfy was shooting a lot of footage around town, and Pug just sort of rose up from the crowd; trying to do wheelies on his bicycle,” Blair said. The bicycle wheelies, of course, are nothing compared to the heart-stopping images of the dirt-bike riders doing wheelies straight up – or at 12 O’Clock. The more ephemeral shots – presented in slow-motion – were filmed from the back of a pick-up truck. In many cases, Steven drove the truck, since he was adept at piloting a vehicle in the middle of the pack of riders. Even so, the city turned a wary eye to the film maker’s effort. Director Lotfy was even arrested once but was ultimately released, when Blair’s attorney pointed out that there is nothing illegal about filming an illegal activity. The four-year project created a bond between the production team, the cast and the outlaw riders. Blair credited his sound design team (including the ethereal choir); the gripping footage captured by Lotfy; a wonderful editor and the Phantom camera for the success of 12 O’Clock Boys. There will be an extended release on Showtime with added footage (the film presently runs 71 minutes). When asked about his next project, Blair laughed and assured the audience that, though it does have a Baltimore connection, it will have nothing to do with illegal activity.